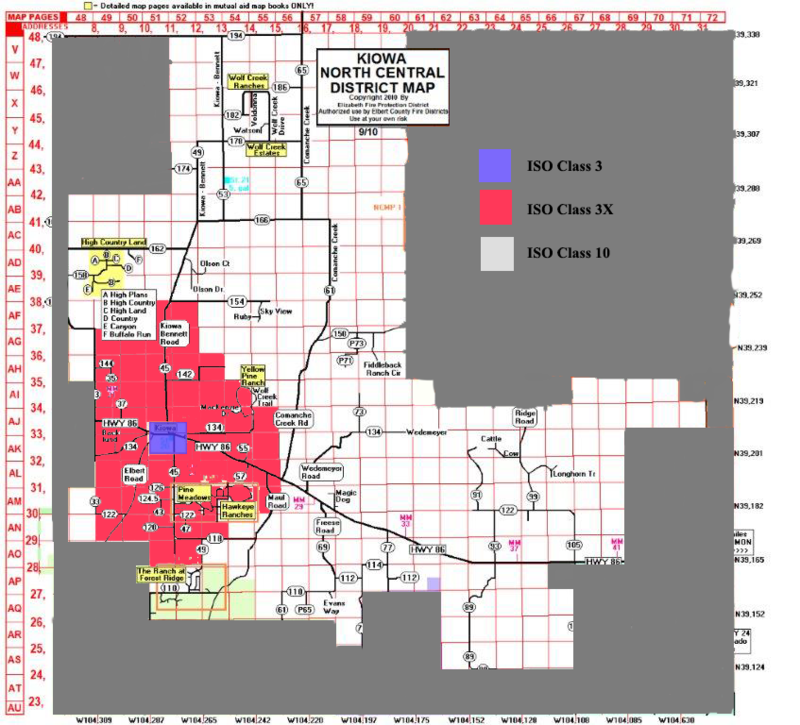 (KIOWA_FIRE_MAPS) The Kiowa Fire Protection District has a population of approximately 1,800 permanent residents with approximately two thirds of the population commuting out of the county for work. The district is mainly comprised of rural agricultural lands with low density mixed value housing on lot’s ranging from three acres up to 35 acres. While the fire district is primarily rural, it also encompasses a small downtown area of about a half of a square mile which includes single and multi-story commercial structures, small residential structures, a mobile home park and the Elbert County Fairgrounds. It is anticipated that Elbert County will experience an annual growth rate of 3.63% or an overall growth rate of 191.1% from 2000-2030. This is expected to exceed the growth rate of neighboring Douglas County. ISO Rating: Due to the efforts to provide greater water, as provided by the Town of Kiowa’s new water system, all the the areas with in the Town of Kiowa received a single PPC rating of 3 (Only 8% of departments rated by ISO are a PPC 3 or better.) Areas within 5 miles of Station #1 but do not have a fire hydrant within 1000 feet received a 3x. All areas greater than 5 miles are still classified as a 10. 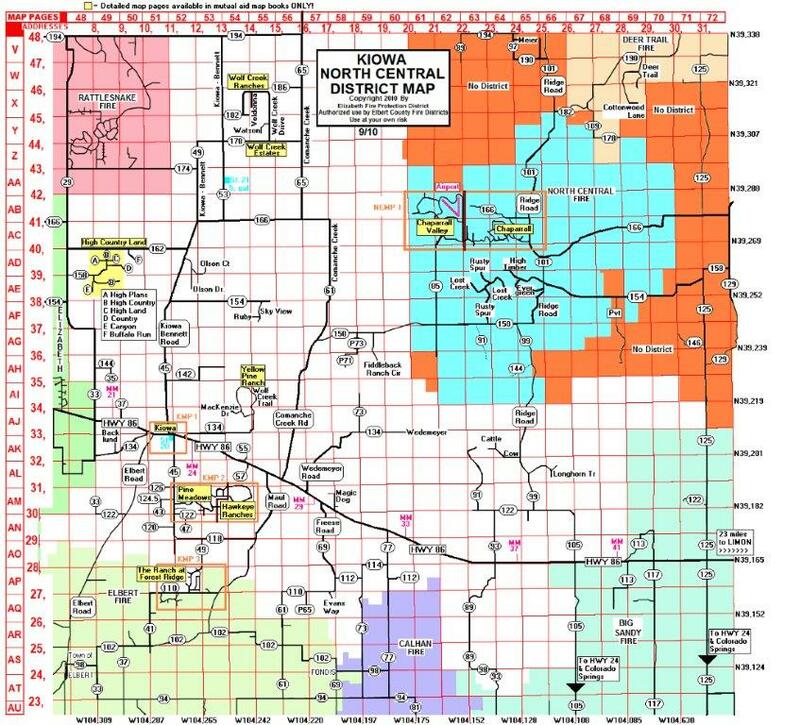 Stations: The fire district is covered by two fire stations, Station 221 is located at 403 County Road 45 in downtown Kiowa and Station 222 is located off of County Road 53 approximately 1.5 miles North of County Road 166. Additionally the fire district maintains an Auxiliary structure called the Annex adjacent to Hwy 86 immediately North East of Station 221. Staffing: The fire district currently employs a career Fire Chief, a career Captain, a career Firefighter/EMT, a part time mechanic and a part time bookkeeper. Additional staffing is supplied by approximately 20 volunteers who reside both in and out of the fire district, and a fire department Special Services Division of approximately 8 personnel. All of our volunteers work shifts at the fire station. Volunteers living in the District also respond to calls from home when available. Call & Response Profile: On average the Kiowa Fire District responded to 334 calls for service, a 16% increase from 2012.. The majority of responses are for Emergency Medical Services (EMS) which accounts for 54% of all calls. Advanced Life Support (ALS) response accounts for approximately 51% of all EMS calls. The district responds to an average of 30 motor vehicle accidents annually, 9.7 calls for structure fires, and 14.3 calls for wildfire/vegetation fires with an annual average total acreage consumed of 400 acres. Fire Prevention Education: The Kiowa Fire District provides early preschool and elementary school level education services targeting children in both school settings, such as during Fire Prevention Week, and non school event settings, such as community festivals, the annual Halloween Party, and out of district events. The district maintains a smoke trailer simulator and motorized interactive fire dog.